It seems that the videos I added to my recent posts aren't working, so I've removed them for now. It worked in the past, but not now. I'll have to look into it as I like to show you guys the rainbows. I'm seriously thinking of revamping my blog. I'm a bit tired of the green. Because of this, I've just spent the past hour researching other nail art blogs and websites that list the "best" nail art blogs. So so many of them are no longer posting. 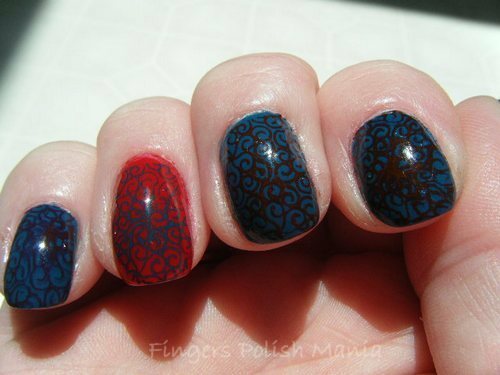 I'm talking the great ones (IMO) from the past when nail art blogging was huge. Like 2012-2016 or so. I'm talking about All Lacquered Up, The PolishAholic, The Nailasaurus, Chalkboard Nails to name a few. Are they posting elsewhere or just gave it up all together? What happened to the blogging? Has another platform replaced it? I know personally, I no longer read blogs and I guess that most people don't read blogs anymore either. What would be really cool is to do mini videos on Instagram like Yagala does. But I am no editing expert and don't feel like learning right now. Maybe it's silly to spend money to revamp something that no one reads, but this blog means a lot to me and I've put countless hours into it since I started back in 2011. It's my way of journaling I guess. Even in my heyday, when this blog was at its most popular, I only got like 200 hits a day. But those 200 people meant something and still do mean something to me. A reader on Facebook yesterday mentioned how my past staged silly bottle shots was like my thing, my signature. That started out as poking fun at blogs for showing the bottles as I thought, who cares? I'm here to see the nail art. But then it turned into something my readers liked. I may need to revive that. Maybe more people would stop by here if I didn't write as much and just focused on doing the nail art. What do you guys think? Do you think a new design and less writing would get more visitors to this space? I'd really like to hear your opinions. Please. 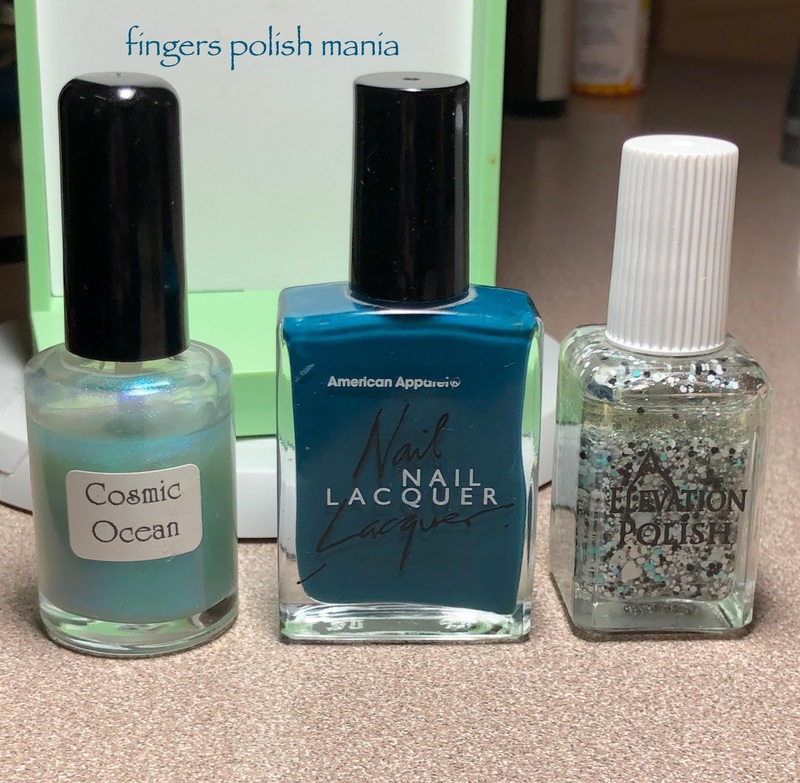 Back when I started this blog, I did a mani using American Apparel nail polish. Somehow it got featured on this website that I've forgotten, but have it printed out and have it somewhere in my house. 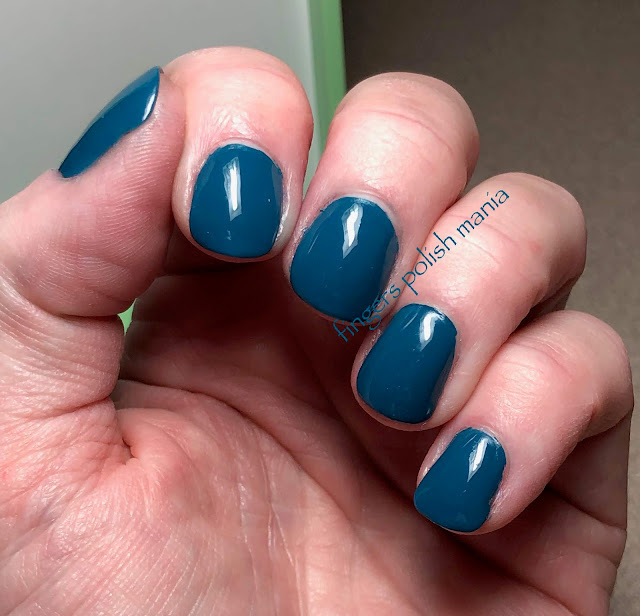 Today when I see that mani, I just cringe. I'll dig it out and paste the link here so you can see for yourself. That was back when I used to post so many pictures. Sunlight, regular light, close ups and macro. 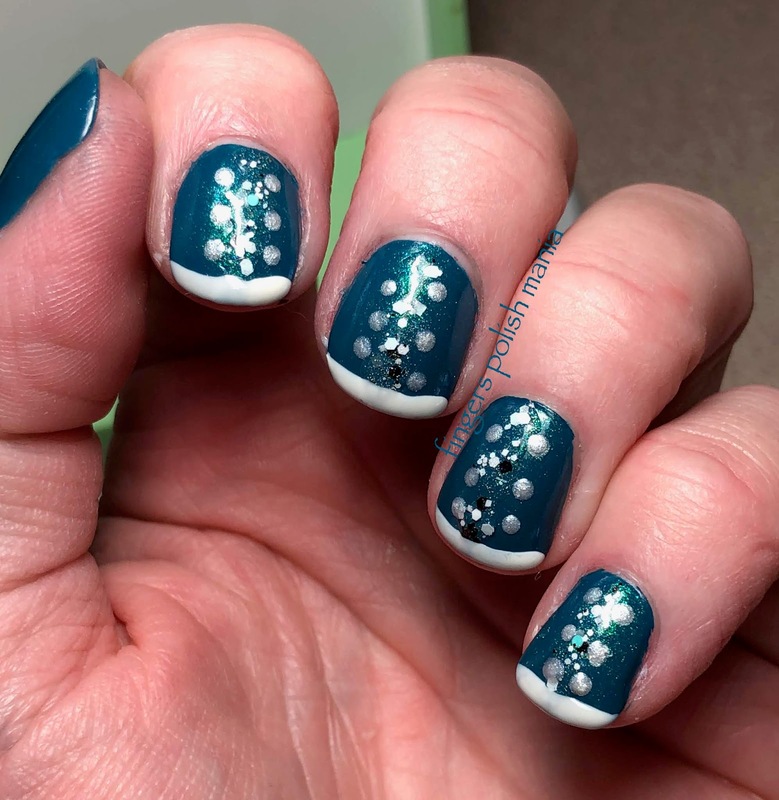 I've stopped using my camera to take my nail photos and have been using my iphone. I need to work on better photos. All right, here is today's silly bottle shot. 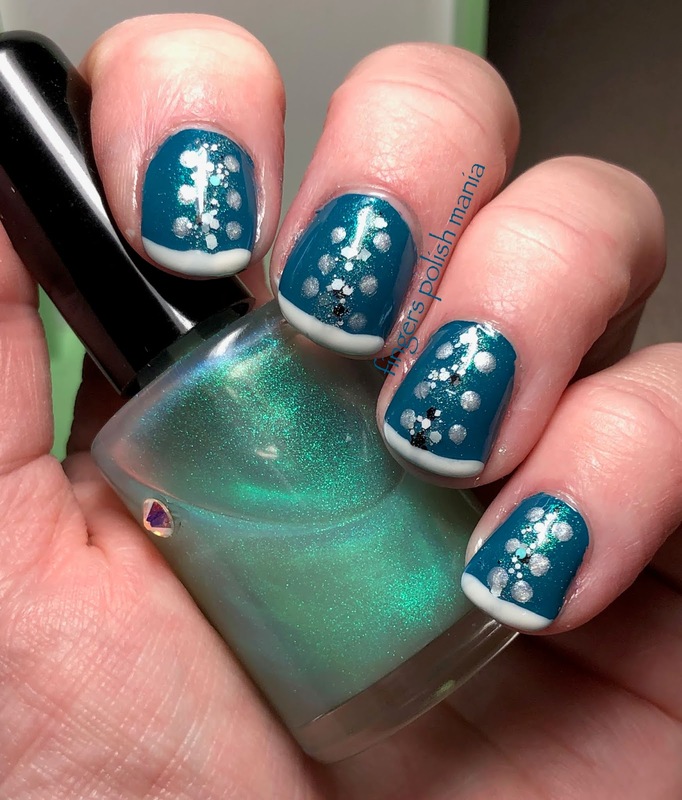 This is Girly Bits Cosmic Ocean, an original from when she first started making polish. American Apparel Peacock and Elevation Polish Con Tanto Affetto Yeti. Another original bottle from when Elevation Polish first started. 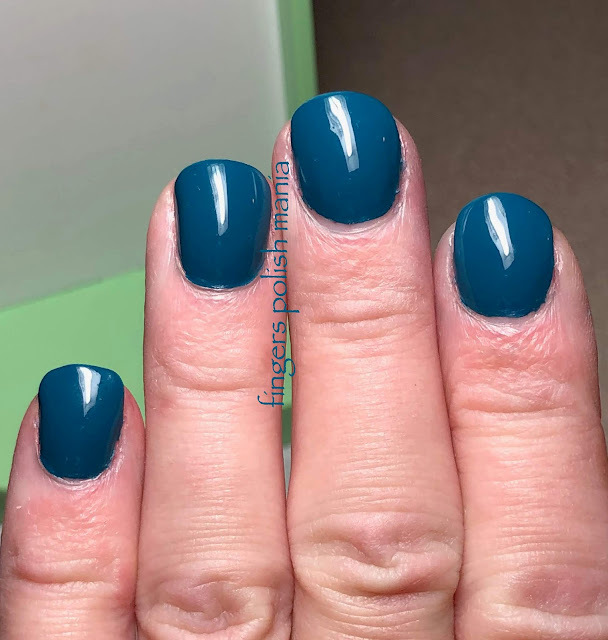 Are there people still making polish out there? I started with American Apparel Peacock. It's a bit more teal IRL. Next I added a layer of Cosmic Ocean. 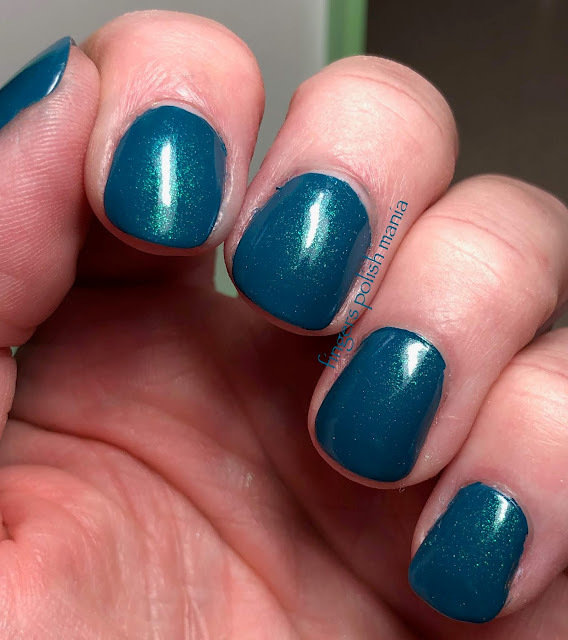 See the gorgeous green shimmer? I love this and have since the day I got it. 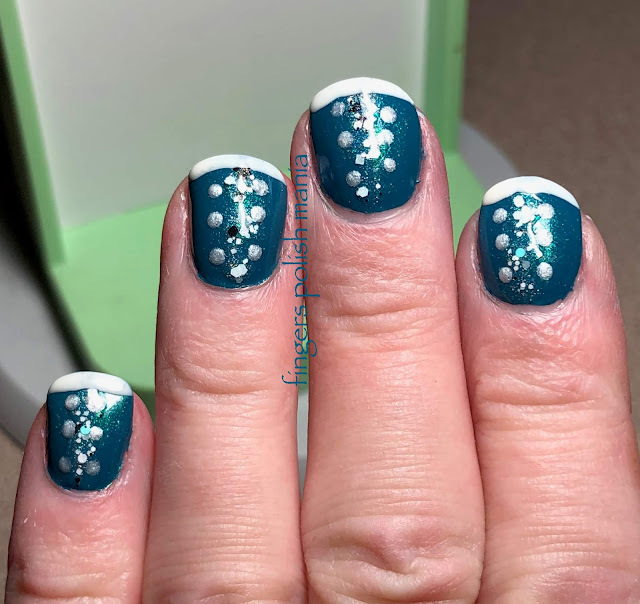 Next I tried making a zigzag design with the glitter, but was a huge fail, so I ended up just adding dots and my funky. Kind of a fail, but I kind of like how it came out. Very wintery. Here is the mani I mentioned that won a place on a website long ago. Don't say I didn't warn you! This was back before I changed to showing my left hand. Yes this is horrible, yes I am aware, but I'm still proud of being on that website.